There is always room for a bit more gold in our lives. The shiny wall grid will add some serious glamour to your walls and is a super versatile and elegant decor piece! It’s the first room you and your guests see when you step inside your flat or house. The hallway isn’t always the most gorgeous room in your home with lots of shoes, jackets, bags and it often gets used to store larger items such as a vacuum cleaner. But the hallway doesn’t have to be an unloved storage room. We want to show you a way to light up the walls with some gold and stylish accessories to make it feel more like home. 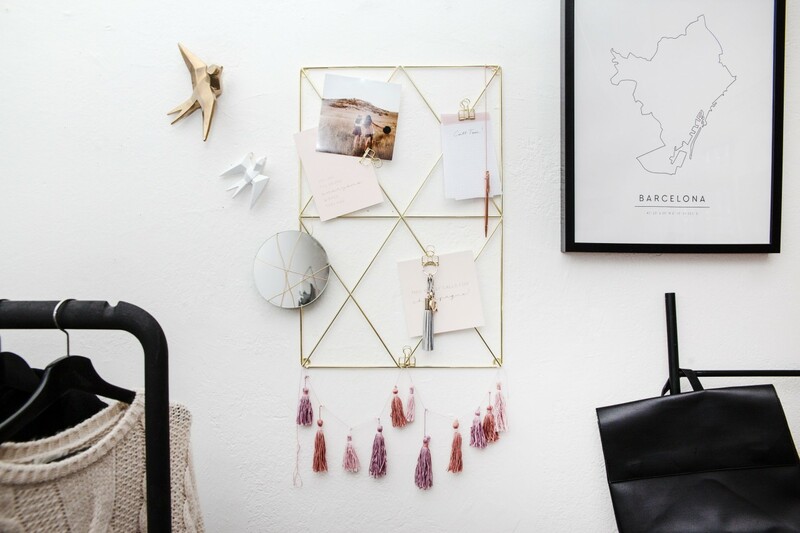 The wall grid adds glamour and also holds your necessities such as a shopping list, pencils, a mirror for a last make-up check and much more. We are staying true to our love of green in the office. There just cannot be enough greenery, fresh and natural tones to light up your working space and to get you motivated to work. Declutter your desk by putting all your notes and lists on your wall grid. This way, you don’t only have more space to think and work, you’ll also have all your daily to-dos right in front of you. 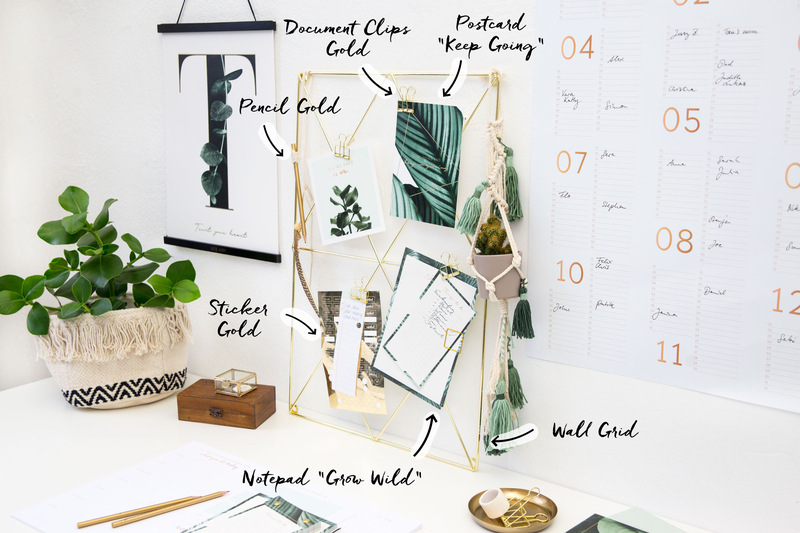 Essentials as pencils, lists and sticky notes make a perfect team with your green cards and plants on the golden grid. 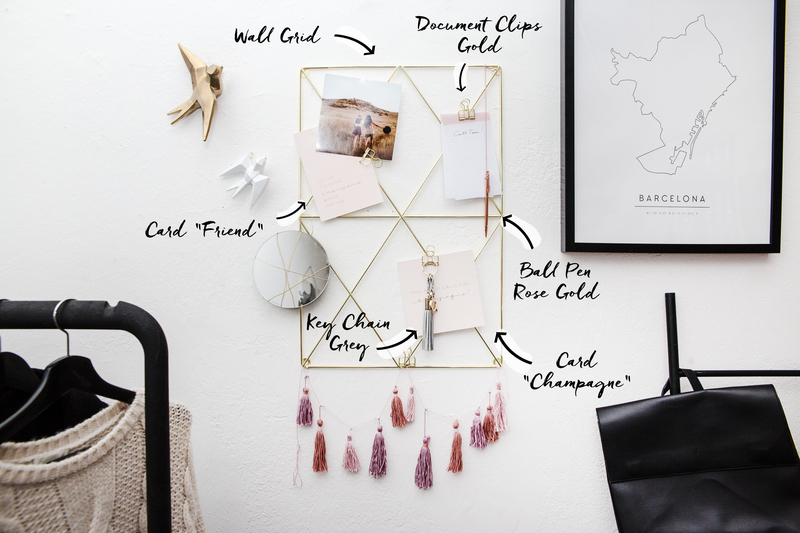 Shop the look: Wall Grid Gold, Document Clips Gold & Postcard "Keep Going"
It’s time to get cozy! Pictures of your dearest make your home more personal, unique and warm. 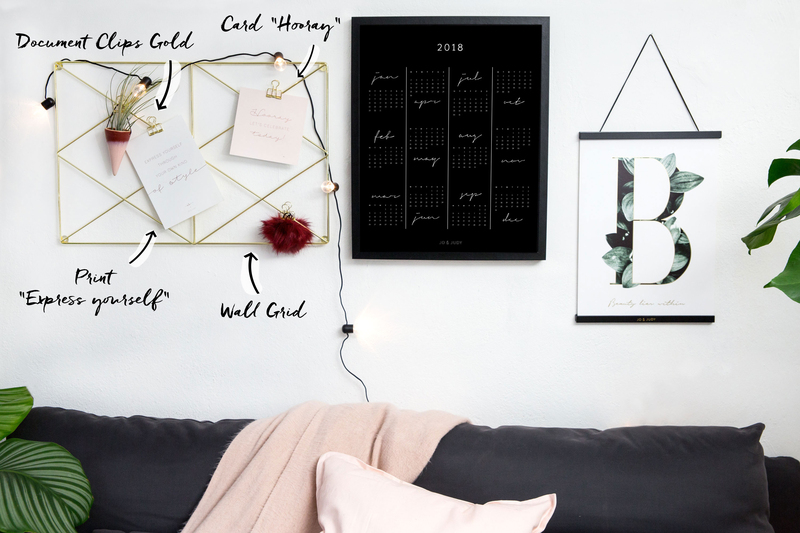 Put smaller photos with the golden document clips to your wall grid and add your favorite quotes and decor pieces for a gorgeous display in the living room. Try not to over-decorate the grid, as it’s already an eye catcher on its own! Shop the look: Wall Grid Gold, Document Clips Gold, Postcard "Hooray" & Print "Express Yourself"